Oil Painting Medic: How do I Paint Blonde Hair on My Portraits? The portrait artist faced with painting blonde hair may automatically reach for titanium white and vary it with black or dark brown for shadows in the belief that these colors will create convincing blonde hair. Instead, the hair looks muddy and flat. What colors should the artist use for blonde hair? 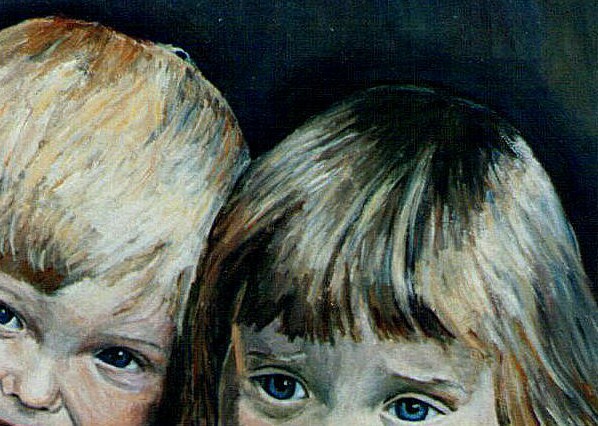 Making blanket assumptions about blonde hair in that it always contains lots of white paint, and allowing this to reflect in the painting. Darkening pale colors with black or dark brown for the shadows, resulting in dirty darks. Applying the dark areas prior to the pales, contaminating the pale colors when they are applied afterwards. In an effort to put this right, the artist may add more white on top, resulting in an overworked painting with dirty pales. Painting the blonde color mix onto a white painting surface, which appear dark by comparison. The artist may inevitably make all the color mixes paler, which has a knock-on effect upon the painting, resulting in a washed-out representation of a blonde haired person in the portrait. Close observation of blonde hair will reveal that it often contains lots of dark color mixes which can be found between strands and on the dark side of the head. Ash blonde, for instance often contains earth colors; platinum hair contains a little blue. Rather than use black or dark brown to darken blonde hair, use a complimentary color. Warm blonde hair, for instance such as honey blonde or strawberry blonde can be darkened with a little blue and earth colour. I often use ultramarine and burnt sienna or ultramarine and a little burnt umber. Cool blonde hair such as ash blonde or dirty blonde hair can be darkened with a little burnt umber and pthalo blue. Work onto a toned ground rather than white when painting a blonde subject. A mid-toned neutral color such as pale brown or smoky blue is ideal. This makes it possible to key in the pale color mixes with the darks more accurately and prevent a ghostly painting of blonde hair. Working from dark to light is also a great exercise in gauging tonal variations accurately. Apply the pale colors prior to the darks. This preserves the clean color mixes for blondes highlights for example, from being sullied by a neighbouring dark color. Create soft gradations between pales and darks with a soft clean sable. Keep wiping the surplus paint onto a clean rag with each stroke to prevent unwanted tonal bands from appearing on the hair. Work from thin paint to thick, finishing off with highlights. I express light catching strands of hair by dragging neat white paint onto selected areas of the portrait with a fine sable. I use the same method for expressing outlines of the hair, such as flyaway stands or rogue locks falling over the face. Remember to express the shadows cast from the hair, such as on the cheeks and brow. Doing so will make the hair look in keeping with the subject. Although many color mixes can be found in blonde hair, the following suggestions may help guide the artist on which oil pigments to use for the base colors. Lots of creams, beiges and greys are not necessary. In fact, I use only the following colors for blonde hair: titanium white, ultramarine blue, pthalo blue, burnt sienna, permanent rose and burnt umber. Remember to always observe the subject for chromatic accuracy. Colors are ordered in largest quantity first. Platinum blonde hair: Titanium white, ultramarine and burnt umber. Ash blonde: Titanium white, pthalo blue and burnt sienna. Golden blonde: Titanium white, burnt sienna and ultramarine. Honey blonde: Titanium white, burnt sienna and burnt umber. Strawberry blonde: Titanium white, burnt sienna, permanent rose and ultramarine. Dark blonde: Titanium white, ultramarine, permanent rose and burnt umber. Rather than use neat white for highlights to blonde hair, use pale color mixes. White mixed with a touch of burnt sienna creates warm yet intense highlights for hair. Other pales to look out for are pale blues, violets, eggshell and pastels. Such definite hues will suggest form and depth of color to blonde hair instead of just white. I need help capturing a blonde hair color. How do I post a photo? I have been using your 3 of your blonde recipes to paint my daughter’s hair in oil. She has several colors in her blonde hair, a dark, ashy, golden, honey, and a few streaks of super-light blonde. But I keep ending up with very orangey tones in each mixture and they are not looking the way yours look in your books and sites (I have a couple of your e-books). Also, is there a certain type of paintbrush that works best for strands of hair? I’ve been using brights and rounds. I haven’t gotten it to look real though. I have just noticed your question on my blog. Sorry for the delay in replying as I have working on other projects. I hope my books have been helpful in other ways. I will get back to you once I have mulled this one over, which will be in the next day or so. Best wishes and thank you for your patience! Hello and thanks for the question. If the color mix for blonde hair ends up too orangey and you want to tone it down, add a little opposing color in order to neutralize it. This entails adding a little pigment with a blue bias, in other words, a cool color. I would add a little ultramarine blue, a tiny bit of burnt umber and (if necessary) white to the unwanted orange mix to get the desired tone. If you want to mix the ash blonde hair color from scratch, I would try mixing (to mostly white) a little ultramarine blue to burnt sienna and a tiny bit of cadmium yellow. This should bring an ashy, slightly golden hue to the mix. Work the darker hues of the hair before expressing the super-light blonde hair strands that you describe. The darker hues of the under-hair can be expressed with a worn bristle or filbert with a rounded edge. A bright can bring unwanted, wedged brush marks, not ideal for blending the hues of hair. Once the darker under-hair has been expressed, the sun-kissed hair-strands can be illustrated on top via a fine, round sable. Mix mostly white into a little burnt sienna and cadmium yellow. Work the fine strands over the darker under-color before the paint is dry so that soft lines can be expressed. Vary the tone along the hair strand to suggest light catching them like spun gold. Some blending and color mixing adjustments will be required before the oil paint has dried. Keep checking the accuracy of the color mix with the subject matter.